Hi Connie here with you today. My hubby loves to take nature pictures and just before his birthday he went on a little hike up this mountain to get sunset pictures and that is what inspired my card for him. I started with the Sizzix basic step card die. Then taking cream cardstock and using distress inks I sponged a sunset background adding a few swipes with my gel pen for clouds. 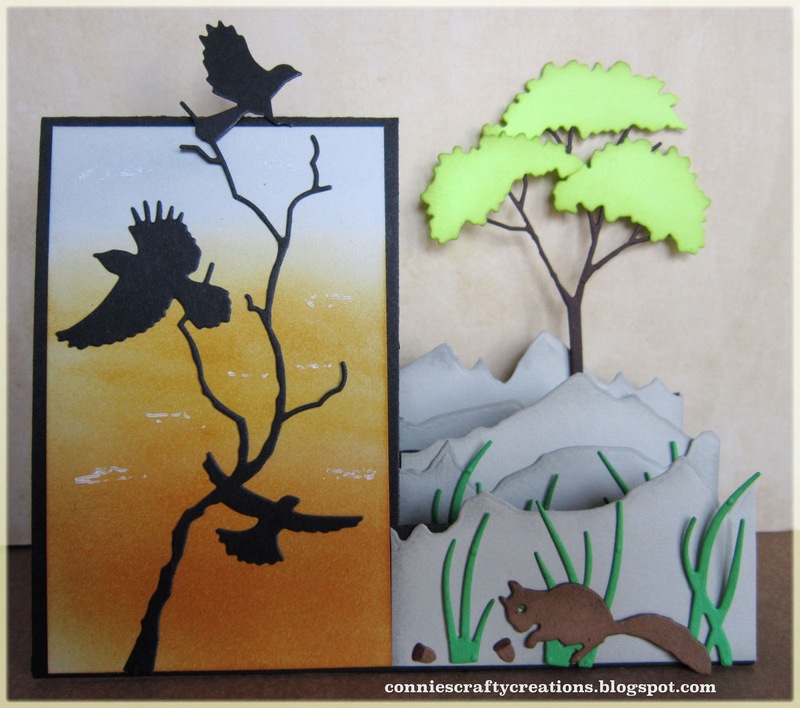 I then added the Memory Box Forest Crows die on top of my sunset. He loves this die. Then I went on to the mountains on the step side and using Impression Obsessions Mountain Landscape layers die I cut and layered a couple mountains onto the last two steps with just one layer on the front. Next I cut the Memory Box bare sappling and added Dees Distinctively Tree Toppers die with a little shading with inks on that also. Next came the Impression Obsession small grass, if you want more lush grass you can cut more but in his photo's on top of the mountain the grass was very sparse. Now I don't know if he saw any Squirrels but I am sure they were around so I added one from the Impression Obsession Squirrels set dies. Here is a view more from the top. So I hope this inspires you to give making a scene of your own a try. WOW....your card is just fantastic Connie! 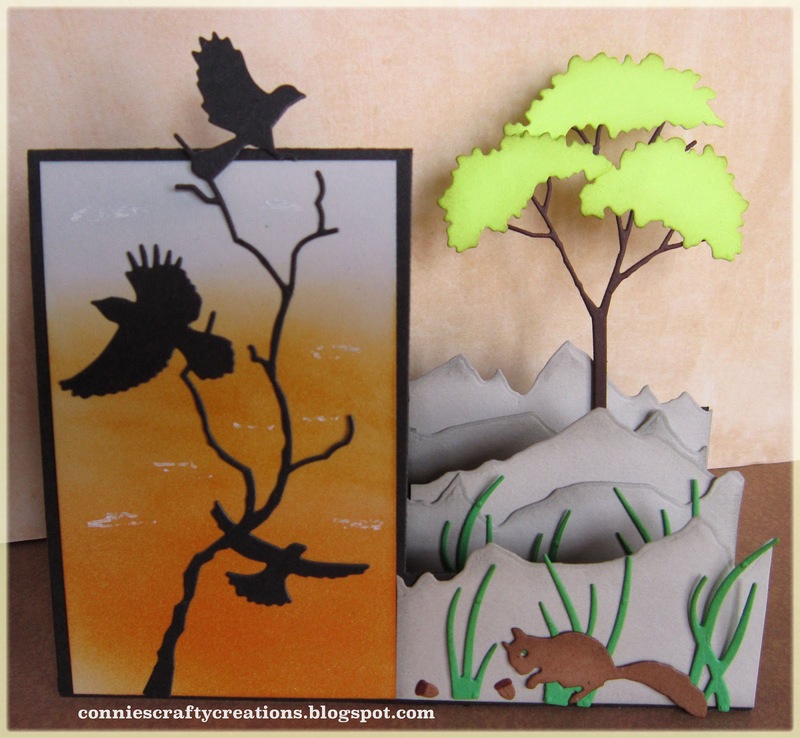 A fabulous scene set on a stepper card, such a clever idea and so creative with the dies you have used. A real work of art and I'm sure your husband absolutely loved it! I never thought to use the mountain dies on a stepper card.......great idea! Love the background inking and crows too. Well now, aren't you clever! What a great idea Connie ... this step scenery card looks awesome! What a fabulous way to use dies ... perfect for your very talented photography hubby! Awesome inspiration ... thanks! Spectacular! Love your design, the left with the beautiful sunset background and bird silhouettes and the right side, with mountain slopes and tree, how cool is that?!?! Perfect dies and you have used them like a master! Bet he loved this! Happy New Year! Your card is awesome, you make it sound fairly easy to make too. I'm sure your hubby loved this. Connie, your card is awesome. You can tell lots of love and work into the design. Wow Connie, this is absolutely stunning! What a thoughtful way to honor your husband on his special day. This is a true work of art! Now this is a work of beauty. Loving those mountains, very creative and clever. He will treasure forever. Wooo!! Connie this card is so cute! Connie this step card just rocks! It is awesome! I love, love all the layers! I think this is one of the best step cards I have ever seen! you rocked it!